Peter Schmeichel has praised his son Kasper for his actions after the helicopter tragedy which claimed the life of Leicester City owner Vichai Srivaddhanaprabha last year. The Foxes lost their influential and inspirational owner in October after the helicopter he was travelling in after the draw with West Ham at the King Power Stadium crashed just outside the stadium after take off. It was a tragedy that rocked the football world, with tributes and respects pouring in from all corners of the globe as Srivaddhanaprabha undoubtedly made a major impact on the sport while also spearheading their memorable Premier League title success under his tenure. 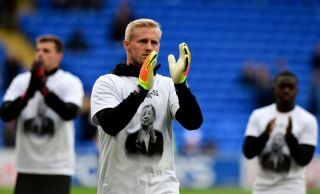 Schmeichel was discussing his son’s bravery and courage to run towards the crash site in the immediate aftermath of the incident, with the Foxes owner and four others dying in the blaze. “You don’t run towards a burning helicopter but that’s what he did,” he told The Sun. “That speaks volumes as to my son’s personality. I still can’t believe it happened. “His instincts is what makes me most proud?.?.?. ?and scared. Like I say, who runs towards a burning helicopter? “I speak to Kasper every day, every single day. We talk about all kinds of stuff. We talk about my life, we talk about his life. Whatever is happening. What Leicester achieved in 2016 will be remembered forever. However, their former owner’s impact went well beyond the pitch, and that is reflected in Schmeichel’s comments above while the pride he has in his son is very evident.